Mama Is Still Here! is a true story of an educated and accomplished African American woman who was raised in the state of Mississippi between the 1940s and 1960s. Daisy: a wife, mother, and everyone's favorite sister, aunt, and friend is admired for her swagger and confidence. But she finds her life spiraling out of control because of impaired memory lapses due to Alzheimer's disease. The devastating diagnosis crushed Daisy and her husband's world, and the world of their adult children. Initially, the way each family member connected to her was at some level of denial and/or anger. The author, Daisy's son, shares their story and his personal grief. 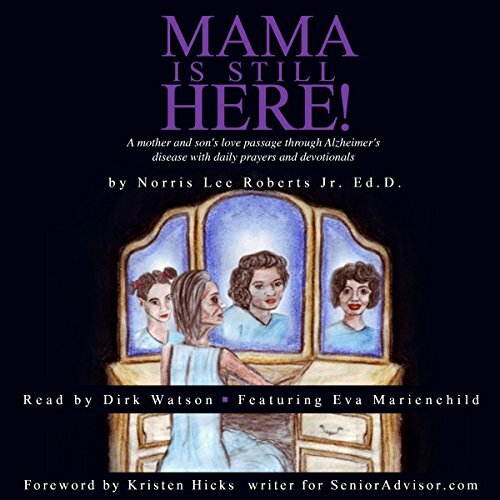 The author also shares his observations and the memory of his mother before and after Alzheimer's diagnosis. The scriptures and prayers at the end of the chapters are a very nice touch, and the epigraphs are very successful at conveying the tone of each chapter. Dr. Norris Lee Roberts, Jr. lives in Saint Peters, MO, with his beautiful wife, elderly father-in-law, a jealous dog, boomerang kids, a feisty granddaughter, and a very ugly student loan debt. ©2013 Norris Lee Roberts, Jr. Ed.D. (P)2015 Norris Lee Roberts, Jr. Ed.D.